The Glass ReSurfacer System is the most efficient, and cost effective means to restore architectural window glass on multi-story buildings. 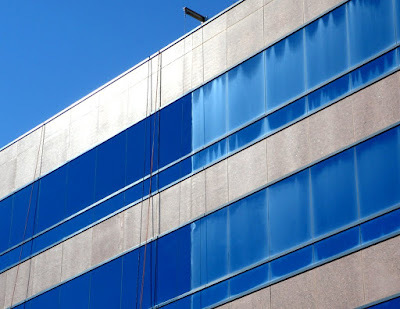 It produces the highest quality results in the industry, and will remove virtually all types of stains and damage from high rise architectural glass surfaces. The Products within The Glass ReSurfacer System are comprised of a combination of high-performance chemical and nano abrasive materials. These products can be used in combination to reverse all types of damage on architectural glass and produce a highly polished, scratch and burn free finish on architectural glass surfaces even when viewed in direct sunlight. This high performance Glass Restoration System effectively and efficiently removes stage 1 and 2 corrosion as well as stains caused by mineral deposits, including silicates, calcium, lime, magnesium, rust, salts, efflorescence and high mineral content tap or well water. This system also removes damage caused by light surface scratches, oxidation, ion exchange, water erosion, soap scum, light acidic graffiti, oils, etching, chemical burns such as acid and acid rain, tin etch haze, adhesive stains, water repellent overspray and/or leaching, caulking or coating residue, exhaust fumes, everyday grime and buildup. This process also removes light scratches caused by harsh abrasive glass restoration products and acid burns on the glass surface due to using hydrofluoric acids, and other flaws from architectural glass surfaces. This product will remove the rainbow effect and tin etch haze from glass. Glass ReSurfacer® Backer Pad - The Glass ReSurfacer Backer Pad attaches to any standard polisher with a 5/8" chuck. This backer pad is sold in 3" and 6" sizes and is designed to hold the Glass ReSurfacer Pad, and provide ample support for polishing glass surfaces. Glass ReSurfacer Pads - This Glass ReSurfacer 3" & 6" Pads are specifically designed to fit on the Glass ReSurfacer Backer Pad for use with our Glass ReSurfacer Polisher or any 5/8 threaded machine. We also have a 1/4 sheet pad which is designed for a palm sander with pressure sensitive adhesive. Glass ReSurfacer® Stripper: Acid-based material used to remove heavy mineral staining prior to the use of Glass ReSurfacer Final Polish; a liquid stripper that should be applied with a cloth applicator only when absolutely necessary. MicroFiber Towels - Microfiber towers specially designed for use with Presto's restoration and protection products. There are many different ways to use The Glass Resurfacer system for glass restoration on a commercial building depending on the level of staining or damage present on the glass. Below is a detailed description to help you select the best process for your project. General Surface Preparation and Light Stains such as stage 1 corrosion, soap scum, over spray and light mineral stains can often be removed using Glass ReSurfacer Final Polish with Presto's Microfiber Towel or a sponge. Use the Glass Defender Series to protect the glass afterwards. If the exterior surface of the glass has any kind of tint or coating this process can be used to remove stains from the surface without removing the coating. Any of the application methods below will remove the coating from the surface completely. Medium stains such as light mineral leaching, over spray, soap scum, use with a random orbital sander. This process also is less likely to scratch the windows on a building in the event a technician contaminates the applicator pad with abrasive particles. Use the Glass Defender Series to protect the glass afterwards. Surface Damage and everything listed above such as mineral leaching, light scratches caused by other glass restoration products, glass surface burns due to using hydrofluoric acids use the Glass ReSurfacer Final Polish with the Glass ReSurfacer Backer Pad and Glass ReSurfacer Pad along with a variable speed polisher. 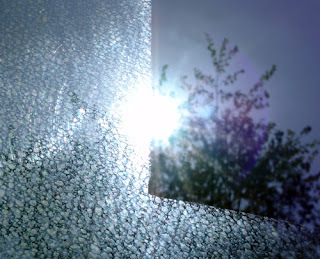 Remember, the more speed and pressure applied to the glass the faster the glass restoration process will work. Use the Glass Defender Series to protect the glass afterwards. Heavy Mineral Stains and everything mentioned above use the Glass ReSurfacer Stripper first in order to help remove the top layer of stains. Follow the stripper with Glass ReSurfacer Final Polish with the Glass ReSurfacer Backer Pad and Glass ReSurfacer Pad along with a variable speed polisher. The Glass ReSurfacer Final Polish will always work, however, some glass surfaces takes longer to polish than others due to heavy mineral staining. The Glass ReSurfacer Stripper is an optional product that will speed up that process by first melting away the thick layer of silica that causing the process to take so long. Use the Glass Defender Series to protect the glass afterwards. Below is a graph that explains the different uses of the Glass Resurfacer System for glass restoration depending on the level of staining or damage present on the glass. The lubrication system you may see in some of the videos is a prototype that is not available to the public but may be special ordered in quantity. Review all product data and MSDS sheets for each of these products prior to use. Downloadable files are at the bottom of every individual product page. System is customizable for virtually any type of glass restoration project. For use on both tempered and plate glass surfaces. Designed to be used on a swing stage or suspended scaffolding on the exterior of a high-rise building. The system will remove light scratches such as scratches caused by abrasive restoration products and or techniques. This system will also remove burns in the glass surface caused by hydrofluoric and or hydrochloric acids. This system will not remove deep scratches or graffiti efficiently. Clean the Glass Resurfacer Pad frequently to prevent scratching. The more speed and pressure applied to the glass, the faster the glass restoration process will work. Click here to watch a video about a 30 story building restored using The Glass Resufacer System 5 years after restoration.